I stepped out into my realm last weekend to find, predictably…utter anarchy. The Supreme Ruler had, after all, been completely laid up for a full month, and had then had a verrrrrrrrrrry slow return to ‘being mobile’ after that. 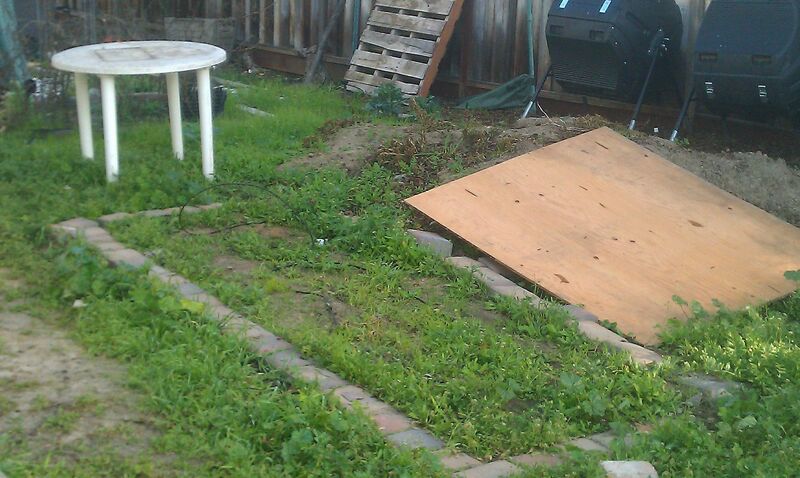 Last month we had almost two full weeks of nearly non-stop rain; this naturally led to an explosion of weeds. 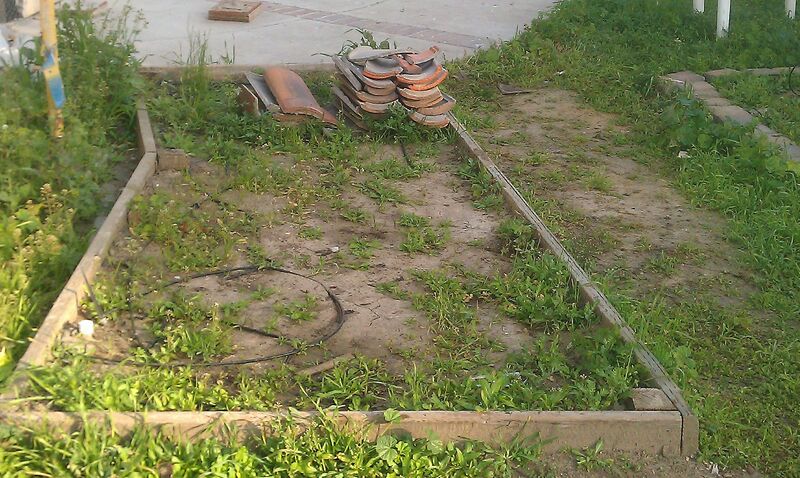 Plus the construction crews have…not exactly had ‘keeping the yard tidy’ at the top of their priority list, either. In short, it is an absolute nightmare out there right now. A view of construction trash through the scaffolding, with weed riot. 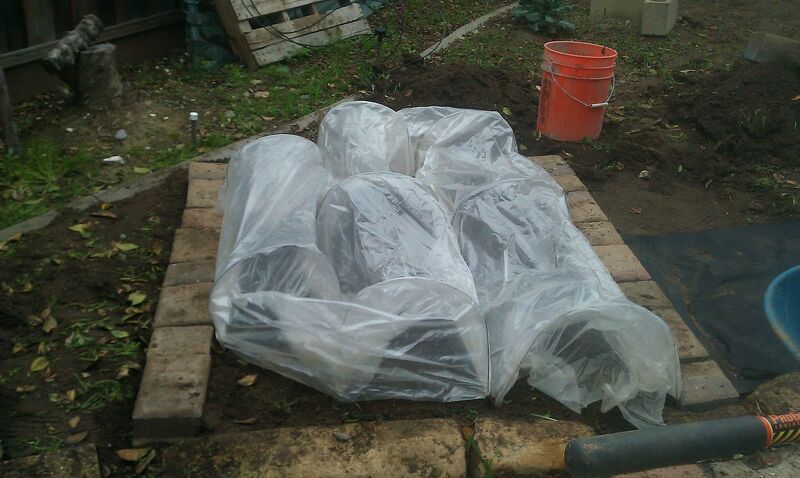 Garden bed, now with bonus broken roofing tiles stacked on the sprinkler manifold. 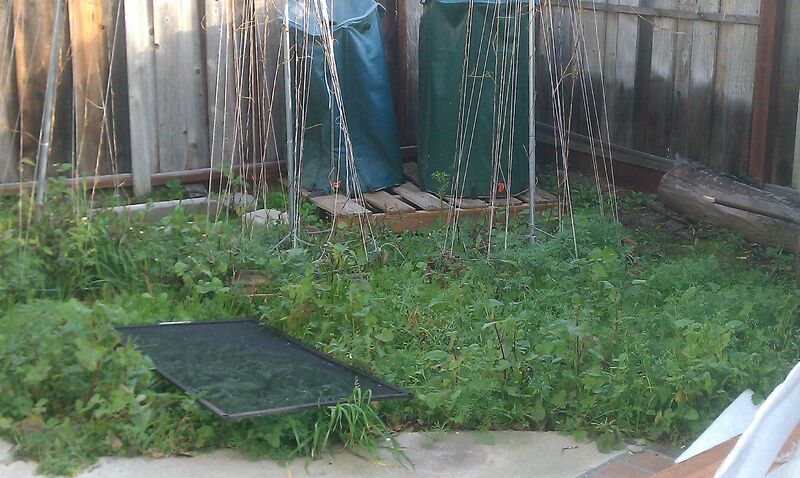 You know what this strawberry bed needs? MORE ROOFING TILES! 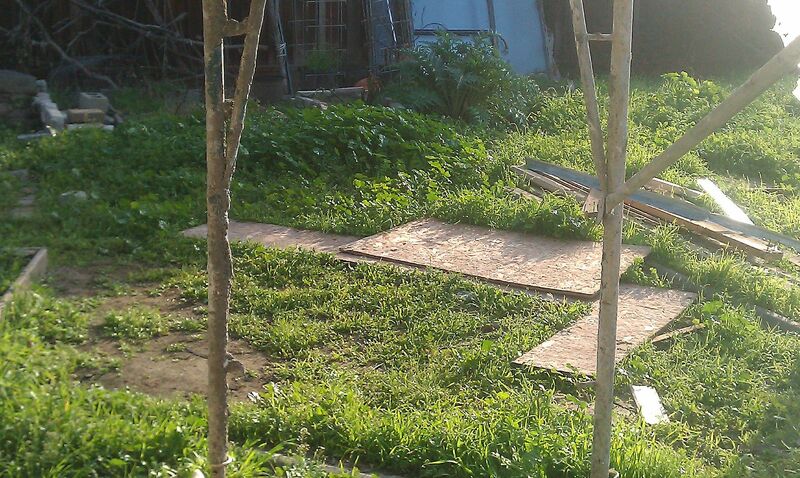 And also some PLYWOOD! 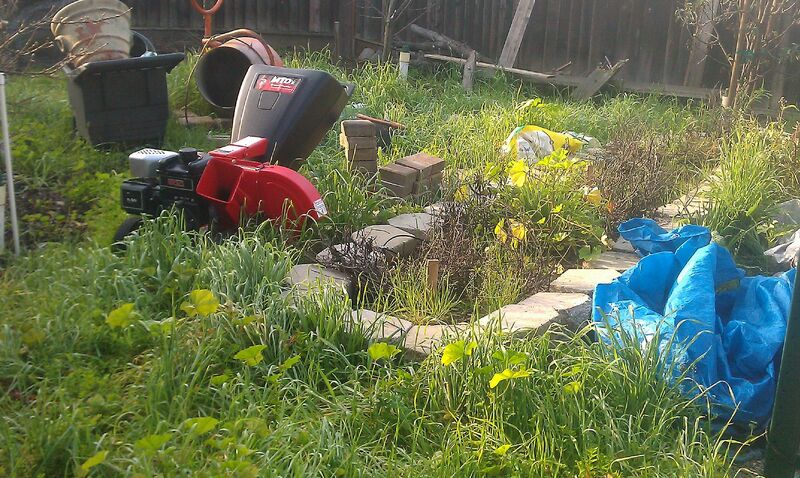 Perhaps we can just take it as-read that the ENTIRE yard is pretty much an enormous cesspool of weeds, machinery that REALLY should have been overwintered somewhere ELSE, masonry that NOBODY remembers putting “there” and yet “there” it is and so forth?? But, in among all the sedition, there were a few loyal subjects. 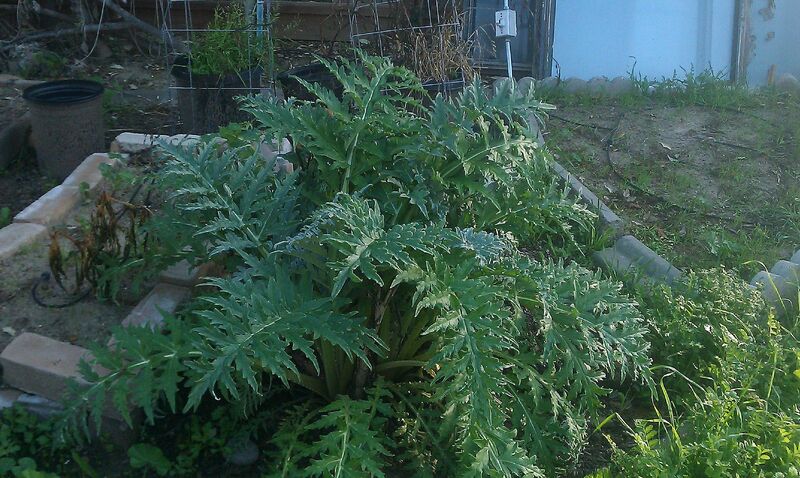 Like the “dead” artichoke plant which suddenly exploded back to life. 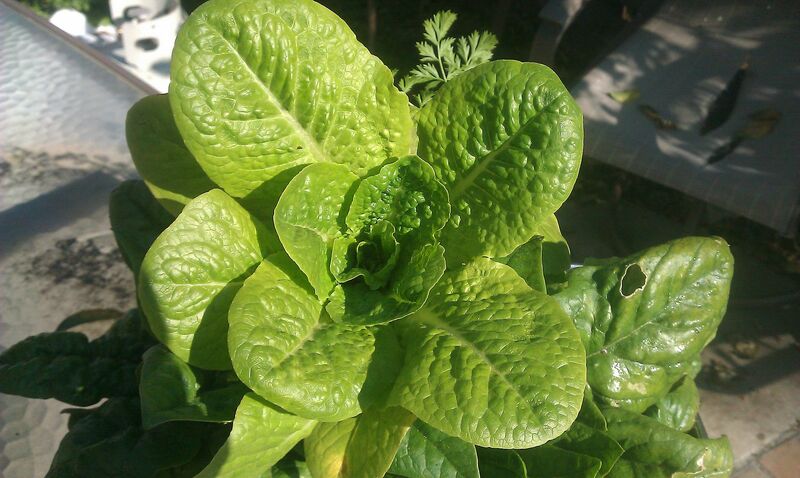 If all goes well, we should have artichokes by Easter! There were some ‘forgotten’ carrots. And a fair amount of spinach. 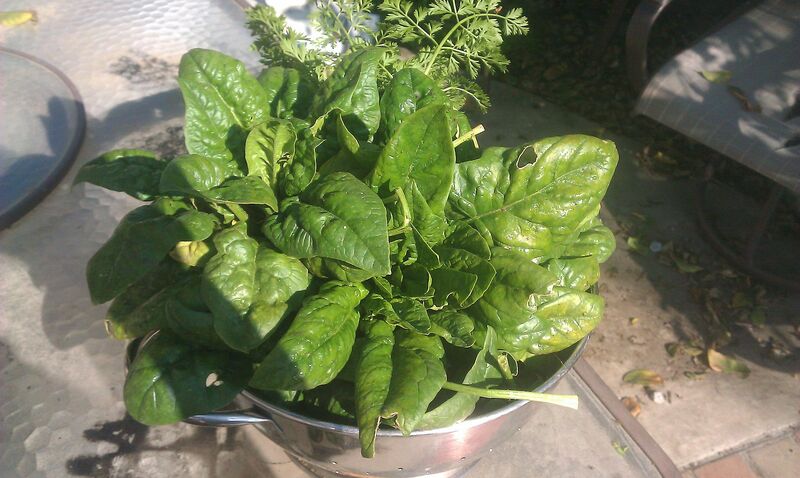 Very sweet spinach, courtesy of the “light frost” weather. 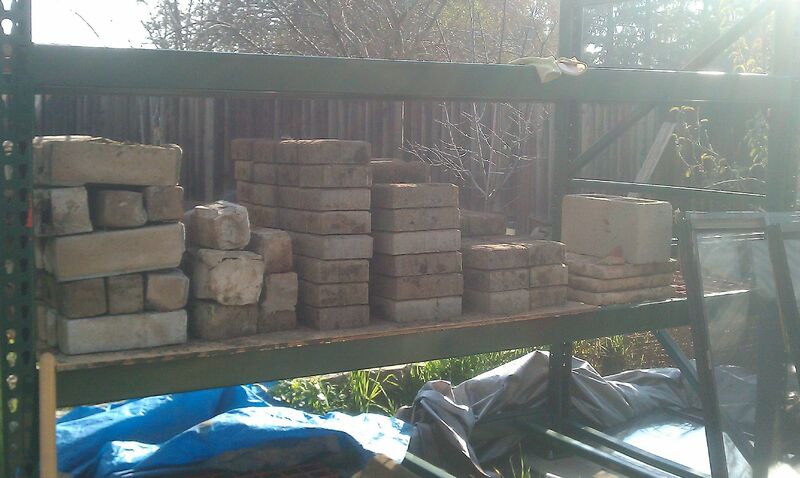 It took almost the entire weekend just to collect together the masonry and random wood planks and such from Everywhere, and stack it neatly in the future greenhouse masonry storage unit. This is one (1) of the shelves. I filled four (4) of them altogether. 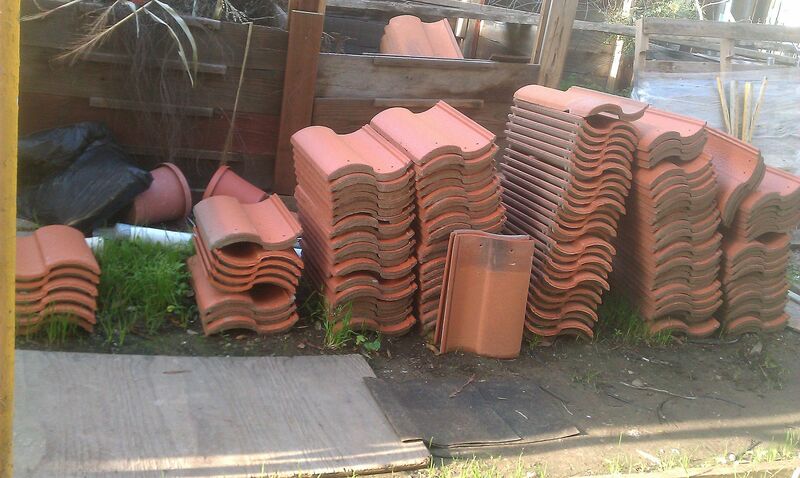 We have a LOT of bricks, slabs, tiles, lumber of all sorts etc. Almost ALL of it from Freecycle, which is an AMAZING source of Such Things around here. 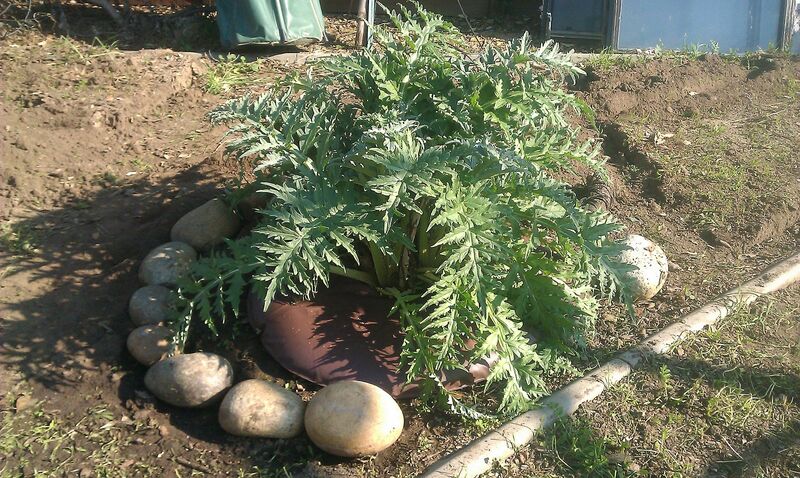 I cleaned up around the artichokes, dropped a Tree Gator Jr. around it even though right now there is so much moisture in the air that the soil is damp 24/7…and then ringed it with river rocks from all over the yard to further encourage water to stay put. 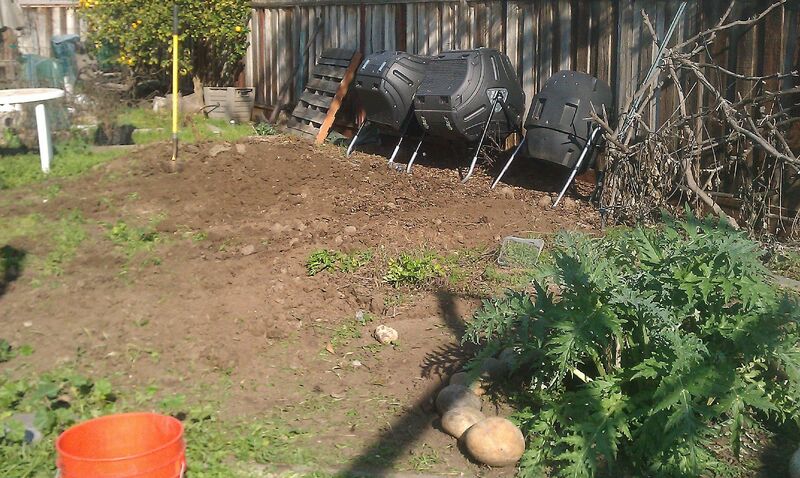 And then I got busy on that big old pile of fill-dirt and the just general trash all over the back 40 (yards). In related news, I overdid it a little bit last weekend. And I paid for it for quite a few days last week. Man. It was like I had a fish hook caught in my calf or something; my foot started swelling up again, and trying to sleep was like hahahahahaha, good luck with that! So today when I got back out there to start building the new beds, and I got one lousy bed (mostly) done and then that muscle started going, “Twinge! Twinge! TWINGE!” while my back was going, “Twitch! Twitch-twitch! TWITCH-TWITCH-TWITCH! !” and shooting little electric shocks up and down my other leg, I abandoned my plan to build two beds today and contented myself with just the one. Dropped some broccoli seed in there, covered it up with plastic to discourage cats and construction crews looking for places to dump their trash, and called it a day. I have to admit, this is something that I struggle with – identifying the point at which ‘reasonable’ becomes ‘unreasonable,’ and where I should be stopping, and what the consequences of not finishing everything on my list exactly when I wanted to actually are. I always feel as if not finishing “everything” means that epic disaster is going to befall; like the whole thing is now jinxed and I’m going to have to work twice as hard to catch up the next time I’m out there. But I seldom actually stop and ask myself what happens if I don’t try to double-down on the effort next time – what happens if it simply takes twice as long to finish. 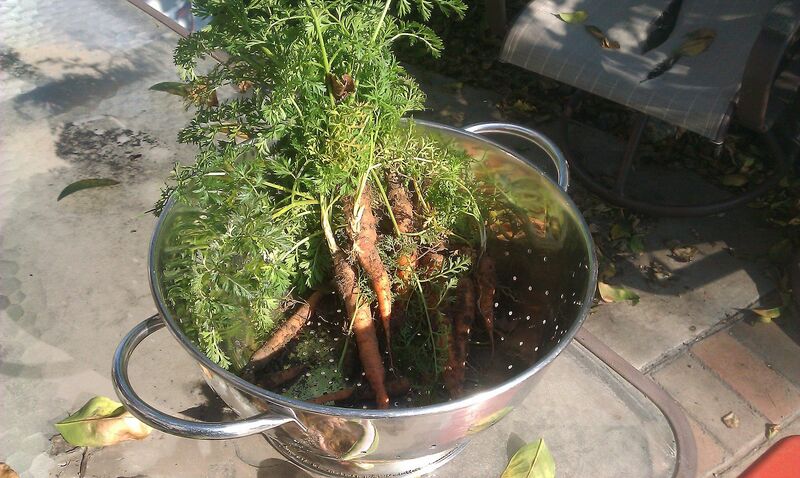 For some things, it is a bit of a disaster; not harvesting things when they’re ready tends to mean you end up with compost rather than food, not paying bills on time results in late fees, stuff like that. …but still not, you know, end of life as we know it sorts of consequences. Hopefully, I’ll be able to keep that in mind as we stroll leisurely toward the next main growing season, and find a lot more enjoyment out of the process than I’ve had the last couple seasons.